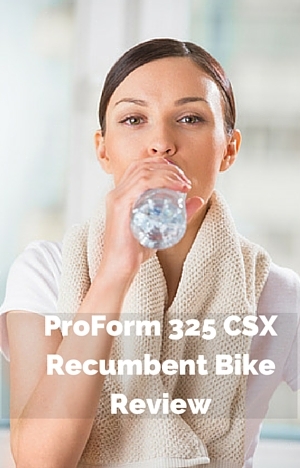 The ProForm 325 CSX Recumbent Bike is a recumbent exercise bike from the people who have a very good reputation in treadmills. Which you’d hope they can live up to with their bikes. This bike has some great features. A seat that can be adjusted to fit the bike properly to people of various sizes. Plus there is 22 levels of magnetic resistance, 24 pre-set workouts for variety and guidance and a range of accessories such as speakers, fan and media shelf. As well as that it needs to be quiet and dependable. Then there is just how fluid and smooth the pedaling is. In my review I look at just how all these features and quality of the bike combine to provide a workout that is gentle on the joints and provides good support for the back. Let’s take a look at how it measures up. Weighing in at 150 lbs this is a solid bike with steel frame and stabilizer bars. There should be no shaking or wobbling as you exercise. Nor should there be any annoying creaks at any level of intensity. You can just get on with working out and if you have the TV on or palying music, so you can enjoy that without interruption. If the bike does rock a little due to an uneven floor there are 2 levelers on the rear stabilizer that you can turn to balance up the bike. They work in the same way as you can find on a washing machine. The limited warranty covers the frame for lifetime and parts and labor for one year. At present there is only one customer review and they’ve only had it a short period so it’s not possible to see how it has stood up to use in people’s homes yet. It does say that the seat is adjustable to fit any leg length (I assume adult leg length). I have asked the company for clarification on this as most bikes do have a lower and upper limit – normally around 5ft 2 ins and 6ft 3 ins. The bike has an easy adjustment method for moving the seat. There is a lever under the seat that you push down to release the seat and then move it back and forth while on the seat to get it in to the right position. Once there you pull the lever to lock it into place. It will only take a few seconds to do this so it can be used by multiple users to get their workout. The 22 levels of magnetic resistance are controlled using the up/down buttons and quick jump buttons on the console when riding in manual mode. When following one of the pre-set programs the resistance is adjusted automatically as you progress through your workout. If the resistance on a workout program is not at the level you want you can change it using the resistance buttons on the console. The resistance is quiet and there is no requirement for ongoing maintenance. It starts out low and moves up in increments to hard. It means those who want low resistance can use the bike to get started as well as those who want something that will challenge them. The transition between levels will be smooth without any sudden increases or decreases in resistance. It has a belt drive and flywheel inside the shroud. This provides a quiet and low maintenance pedaling motion. It has a freewheel clutch which is like you have on an outdoor bike where when you slow down your pedaling the flywheel disengages so the pedals don’t get pulled around by the flywheel when you want to stop pedaling. It makes stopping easier on the joints. It still provides the round pedaling motion so you don’t get any choppiness which might add impact to it due to inertia weighted flywheel being able to keep the speed consistent at the higher levels of resistance. The pedals screw into a 3 piece crank which provides a more secure and durable experience that should stand up to the most intense workouts without any maintenance issues. The pedals are textured and have straps to keep your feet in place as you pedal. Once adjusted for your shoe size you can just slide your feet into place provided the strap adjustment hasn’t been changed. It is a plastic strap with holes along it that are fitted over a tab on the pedal to make the adjustment. Seat. It is an oversized padded seat with padded back rest to provide comfort and support as you workout. There isn’t any contouring but most people should find this a comfortable seat and gives good support to the lumbar region. The backrest is angled slightly to provide more support and comfort. The angle or vertical position can’t be changed. You may find despite the cushioning that you find yourself uncomfortable or experiencing pain that cuts short your workout or ability to “enjoy” it. If that is the case most people find a small cushion and/or folded up towel adds the comfort needed to make it a much better experience. The bike has an easy step through design so you don’t have to lift your foot up over the frame. You can also use the handlebars at the front to help in supporting you as you get on and off the seat. Handlebars. The bike has two sets of handlebars one set by the console at the front of the bike and the other set is by the seat. As well as being helpful to get on and off the bike the set at the front give you a more upright position to exercise in for a more effective overall workout. Unlike most recumbent exercise bikes the hand pulse sensors are in the handlebars at the front of the bike. The positioning of the handlebars does mean you shouldn’t have to lean forward off the backrest to grip them. It also does mean there is less wiring running through the bike. The set by the seat are at the height of the seat so shouldn’t get in the way while you exercise. It does mean you can probably slide into the seat without too much trouble. They do have grip on the end to make them easy to hold when hands get wet. The height of them is reasonable to be able to use as leverage when pushing hard pedaling. Noise. The bike is going to operate very quietly. It will be quiet enough to hear the TV without turning it up. It won’t disturb others in the house and unless they are very light sleepers you should be workout while they are a sleep so you can fit it around your hours of work etc. If you live in apartment you won’t disturb your neighbors like you might do with a treadmill. If you do have some concern about anyone living below you then a rubber exercise mat should stop any vibration or noise that might arise from transmitting through the floor. Cleaning. There isn’t too much cleaning involved with this bike. It does need to be wiped down to stop sweat from damaging the bike as this can be very corrosive. Sweat may also drop onto the floor. If you want to protect your floor you may want to put the bike on rubber exercise mat. It needs an area of 25.4 by 56.8 for storage, so won’t fit in most closets. It is likely if you can’t leave it in place that the best place to store it is against a wall. It is a heavy bike weighing in at 150 lbs but you don’t have to lift it to move it along the same floor level, but you probably don’t want to be moving it up or down stairs that often. The end caps on the front stabilizer work as transport wheels which makes them easier to tip the bike to use them. You do this by using the handle on the back stabilizer bars. As much of the weight is at the front of the bike. It doesn’t take too much effort to do this and won’t have to lift it too high to have the wheels working. You can then move the bike to where you want it. One person can do this but a little care needs to be taken due to the weight even if most of it is supported by the wheels at the front. You should not have any issues on most surfaces except very soft carpet or carpets with a deep pile where you may find it is more of a drag then roll. Also if moving across a wood floor you may want to test it out to ensure the wheels don’t scratch the floor before moving it all the way across the floor. The bikes comes partly assembled. To finish the assembly is straightforward and can be completed within 1 to 2 hours. In addition to the tools supplied you need a Phillips screwdriver and adjustable wrench. You can do this on your own but it is heavy so it is much easier having a second person to help with holding pieces in place as you fix them to the frame (the manual recommends two people). The instructions and diagrams are clear. The most difficult parts, aside from the weight are likely to be ensuring you don’t pinch the wires as you attach the front support and console. You are adding the major pieces of the seat, pedals, console etc. to the frame and drive which have already been assembled which makes it easier than most kitset furniture. It has a nice looking display but doesn’t provide you with the same type of workout progress that you see on other recumbent exercise bikes that have pre-set programs i.e. a matrix display with columns at different heights showing you where you are up to and what is to come with the columns signifying time segments and height letting you know the resistance level for that segment. Instead it has a dial in the center of the console for displaying measures and progress. The +/- buttons inside the dial is where you set a power target based on watts per kg. If you set one a segment of the power ring will flash to let you know if you need to increase or decrease pace to maintain target output. The display button allows you to select the measures you want to see displayed inside the dial. The ring at the edge of the dial graphically indicates power output. The measures displayed individually in the center are calories, distance, pace, heart rate (if monitoring your heart or pulse), resistance level, time (elapsed or remaining) or watts. By pressing the display button you can scroll through the measures or if you select scan it rotate through the numbers displaying each for a few seconds. It has 12 tempo programs and 12 interval programs you can select using the tempo button and interval button respectively on either side of the measures dial. The manual doesn’t provide information on the individual profiles. They work in the usual way where the resistance is changed automatically as you move through the program and prompts you to keep to a target watts output (power based on resistance and RPM). As well as those there is the manual option where you can just get on the bike and change resistance as you go or set up your own custom program. You can set up your own intervals that will repeat if you want using the recovery/interval buttons and the resistance buttons to determine levels as well as a power output target. When choosing any of the options you are asked to set your weight which you use the up/down weight buttons if you want or it uses the default of 150 lbs. The dial shows your power in terms of watts per kilogram that colors in as you increase output and erases as output decreases – there are 3 segments to this dial endurance, tempo and peak. To select a pre-set workout you push either the tempo or interval buttons repeatedly until you get to the workout you want. The programs are split into time segments of 1 minute long where there is set resistance and a target power set (for motivation only). The workouts last for a pre-determined time that you can’t change. Apart from time showing remaining time left rather than elapsed there is nothing to track else to track progress through workout (you do have all the measures available). There is plenty of choice but the information on each of the workouts is lacking as you don’t know how long they are or the resistance profile to get an idea how hard each one might be. They’re not described in the downloadable manual. Seems to be a bit of an oversight as you can’t see them on the display. After several minutes of inactivity the console will turn off and reset itself automatically. If you want to record and track your workouts you can do this manually or download the iFit App on to a smart device and then pair with your bike. This doesn’t give you extra pre-set workouts but does allow you to track and record workouts as long as enter calories etc. to help track your overall fitness too. To use heart rate monitor you have to grip both hand pulse sensors on the handlebars (by the console) or using a bluetooth compatible heart strap (which needs to be bought separately). When using the hand pulse sensors you need to grip them both and if you take a hand off it loses signal, so you need to keep them on the whole time for consistent reading. In addition many people find these type of sensors difficult to get a good reliable reading anyway. That is just the way with them unfortunately. To connect a Bluetooth Smart Heart Rate monitor involves pressing the Bluetooth smart button on the top right of the console and that will connect them together. You then can have a more reliable monitor of your heart rate to help with exercising at the most effective rate for your fitness goals. The bike comes with some good accessories for a more convenient workout. Water Bottle Holder – At the end of the drive shroud closest to the seat is the water bottle holder. It puts it in a handy position to reach for it when you want to take drink. Media Tray. At the top is a tray that you can place in tablets and ipads. It holds them securely and can be turned to the angle you want to use your tablet at. Being at the top of the console it means you can still your workout progress while enjoying your videos etc. Fan. At the bottom of the console is a fan that is multi speed. You adjust the speed by pushing the fan button just above it to the left. Speakers. These are on both sides of the console. To use them you plug your media device into the audio jack on the with a male to male audio cable (needs to be supplied separately). You need to press play and select track using your media player, but to adjust the volume you can either do it on your player or use volume buttons on the console. There was only one review left for this bike when I checked. They said the assembly was easy. Although on a previous model the 315 CSX reviews are mixed with 30% rating the bike a 1 or 2 due in the main to problems with repair issues when out of warranty. And it seems the company charging almost as much for parts as it does for the bike. Most of the issues did seem to be when the bike is out of warranty. It does seem the bikes aren’t as reliable as their treadmills. We shall see – at least it’s started off on the right foot. When there are some more reviews I’ll come back and update this section. Included in the price are a range of accessories as well as pre-set programs which at current price provides pretty good value compared to other bikes with similar features and benefits. When I checked on Amazon it qualified for Prime and free shipping. I think based on the reviews of the previous bike I unfortunately do have some reservations about how durable the Proform 325 CSX Recumbent Bike is likely to be. If you do buy it is worth checking out an extended service/ protection plan of some sort for peace of mind based on the experience with the previous model. (I’m not usually a fan of these type of policies but in this case it probably is worth it). As an alternative you might consider the well rated Schwinn 270 ( but it is around $50 extra) or the Ironman X-Class 410 (higher priced again) with similar features but they don’t work with iFit App. It does depend really on how important the iFit App is to you and the more affordable price as to whether the bike is the right one for you. It looks so comfortable too! I just bought one and find it is very good value for money, being 5″ 11″ and quite heavy, the machine doesn’t move and is very quiet. Thanks for this. It is very much appreciated. Pity about IFIT though. Just purchased this on 11/25/17. Was looking forward to having same luck as other users. On the surface the bike looks great. Assembly was ok except for the slider for the seat adjustment. I spent two hours trying to figure out what the problem was. Eventually I had to completely dismantle the slider assembly and discovered the plastic brake was assembled or flipped in the wrong direction. The bike isn’t so silent. I am hearing a rattle noise when pedaling. After reviewing the documentation it is clear what the issue is. “Made In China” excellent job pro-form on your outsourcing. <<Not really I'm disgusted. The durability of the equipment and how it is made is poor. Just putting it together very carefully resulted in chipped paint. For anyone giving this product higher than 6 out of 10 needs to get your eyes checked or you just don't know how to rate a product. I'm giving this product a 5. I'm very fair when writing reviews. This isn't a top end stationary but for 449.00 the materials should be better. I will be contacting pro-form for the rattling issue which is completely unacceptable. Sorry to hear about your troubles. Thanks for taking the time for rating and posting this. I hope you got your rattling problem sorted with ProForm. I am on my third re-order. Yes, you read that right. The two previous orders came damaged-when unpacked broken parts were all over! I was hesitant to reorder for the third time, but was told it will be hand picked. If it comes damaged once again, I give up! Very disappointed as I had planned on using the bike over a month ago. Instead I have spent countless hours trying to get these bikes returned and having a credit issued. They better come up with some suitable compensation or they will be receiving some very bad reviews from me, which would result in lost revenue for them. That’s not good. I hope it was third time lucky. Where did you buy it from? While the bike is well constructed and comfortable to ride there are some significant problems. I got mine about three months ago, purely for weight loss rather than any serious exercise regime. Like others I had an immediate problem with the seat assembly – the brake was in upside-down and even after reversing the seat tends to rock a bit during use. Basically I can’t can’t adjust the seat once set as it will cause the whole unit to shake. The upright handlebar unit is very solid and nuts are tightened fully but it rocks quite a lot. The biggest drawback is the computer’s shortcomings. It has no memory function worth talking about. After use the unit switches off automatically after a few minutes and if I return 15 minutes later I have to re-enter the weight details again. I’ve stopped doing that because all it does is tell how many calories you’ve burned – nor is there an odometer electronic or otherwise to tell you total distance travelled – basically once the computer auto switches off everything is lost. There is the option of adding the iFit via bluetooth but I don’t see why I should have to pay extra for something which should be standard – my aunt had a basic non-computerised bike 20 years ago which had a speedometer / odometer and it cost a fraction of the price. In general the Pro-Form 325 CSX would be an excellent bike if the seat issue could be sorted out and a computer that actually store key data and the user’s use history . Thanks for letting us know about the problems with the seat. I agree the computer is a disappointing that it doesn’t store your details and workouts and a basic Ifit account should be included with the bike.